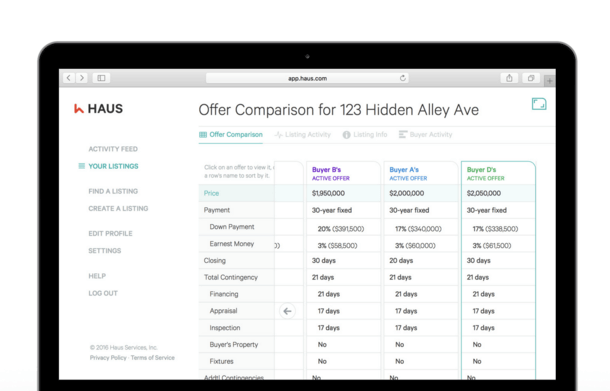 A new company called “Haus” wants to completely disrupt the home bidding process so everyone involved can see the offers being made on a particular property. As it stands now, offers made on properties aren’t openly disclosed to anyone. 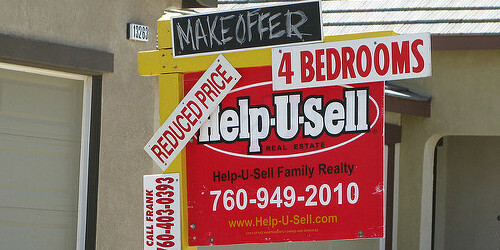 As a buyer, you’re told by your real estate agent what you should offer. Alternatively, you can tell them what you’d like to offer, or what you can afford to offer, then you fill out a bunch of paperwork and wait to hear back from the seller. You’ll eventually be told if your offer was accepted, countered, or just plain rejected. As a seller, your told by the listing agent if someone made an offer and if it’s worth taking, even if there’s another offer out there being ignored or played down for one reason or another. With Haus, the home bidding process is a lot different, and fortunately for everyone involved, a lot more convenient. Well, that’s the plan anyway. The way it works is fairly simple. 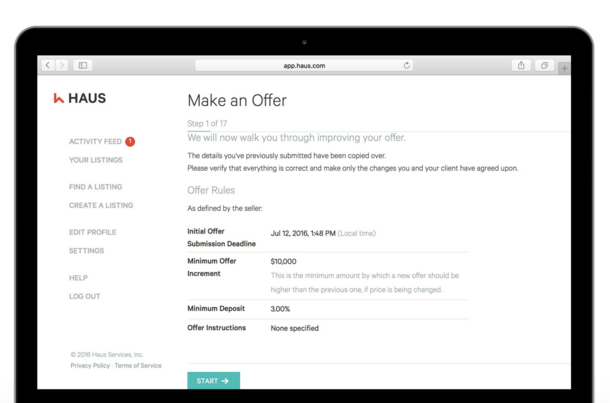 First, a seller lists the property on Haus, including the minimum offer price and the rules related to the offer, such as when offers can be made and the deadline to submit offers. A minimum offer price is set below the list price and the prospective buyer can enter an amount in between those two figures or over the list price, all online. With the offer the buyer can submit relevant paperwork by uploading documents via the Haus platform. Once submitted, the buyer and their agent gain access to all other submitted offers to see where they stand. As you can see from the screenshot above, buyers will be able to determine how they stack up compared to other buyers by comparing offer price, down payment, earnest money, closing date, contingencies, and so on. The sellers will also be able to conveniently compare the offers in one place, side-by-side, to better assess the situation. In the end, the hope is a more transparent and fair bidding process where both sides come out ahead. Although, it kind of makes you wonder what the point of a real estate agent would be. Assuming you could use Haus with the likes of Zillow and Redfin, what else would you need from an agent? Haus is beneficial to sellers because it provides instant updates whenever someone makes an offer on their home. They can opt in to text updates and access all the information from the bids in real-time, instead of waiting for their agent to tell them what a potential buyer offered. You won’t have to play phone tag or meet at a local Starbucks to discuss the numbers. You’ll just open the Haus app and see what the latest offer is. Additionally, a sense of urgency can be created by notifying prospective buyers when other offers have been made. In this case, the price and terms aren’t disclosed, but it could be enough to make those on the sidelines dive in. The convenience of changing and accepting offers online with digital signatures is also a plus. As a buyer, you get a lot more information via Haus than you would via the traditional bidding process. At the moment, you’re basically in the dark and at the mercy of what the real estate agents tell you. You might know nothing other than your offer (or even be misled) depending on the scrupulousness of the agents involved. When an offer is submitted via Haus, you get to see all the other live offers so there’s no guessing or feeling slighted. Sure, you could have offered a lot more than the other buyers, or you might be the only individual making an offer. But at least you’ll know. For the record, if a property is listed on Haus it cannot be listed elsewhere. And bids can only be made via Haus, so you won’t have to worry about any hidden/outside offers. As seen in the top screenshot, you’ll be able to compare offers side-by-side with the identities of the buyers withheld. From there you can fine-tune your offer if you want to beat out of the competition. This can all be done online via the Haus platform as seen above. That saves time and makes life easier. Obviously this can be a good thing or a bad thing. It might actually create a frenzy if it turns into some sort of eBay bidding war. Conversely, prospective buyers might be able to make lowball offers (within the limits of the agreement) and then determine if any other buyers are out there, instead of making too high of an offer at the outset. It’s an interesting approach and would certainly make the process move a bit faster. No one likes to wait for things nowadays, that’s an absolute certainty. However, it’s unclear how Haus would make money and how they could substantiate charging any party unless someone actually saves/makes money in the process. Read more: How much to offer for a home.